Rihanna Admits to Oprah: Chris Brown "Needed Help"
The singer reveals how she felt sympathy for Brown following her 2009 assault. Rihanna opens up to Oprah about her ex-Chris Brown on "Oprah's Next Chapter." Pop superstar Rihanna says even after ex-boyfriend Chris Brown assaulted her in 2009, she was concerned about him in the aftermath. She talked about the painful event during an interview for "Oprah's Next Chapter," which will air Sunday on the OWN network. "Everything I knew switched in a night," she reveals in the interview, which was taped in the singer's home country of Barbados. Breaking into tears, Rihanna goes on to say that she was more concerned for Brown and his public perception than for herself. "Everybody's gonna say he's a monster without looking at the source," she says. "And I was more concerned about him." "It was a weird, confusing space to be in, because as angry as I was, as angry and hurt and betrayed, I just felt like he made that mistake because he needed help," she adds during the interview . "And like who's gonna help him? Nobody's gonna say he needs help." Brown beat Rihanna in a car the weekend of the 2009 Grammys following a fight over a text message he had received, leaving her face bloodied, her arms covered in bruises and her ear bitten, according to the arrest affidavit. Brown pleaded guilty and received five years probation. 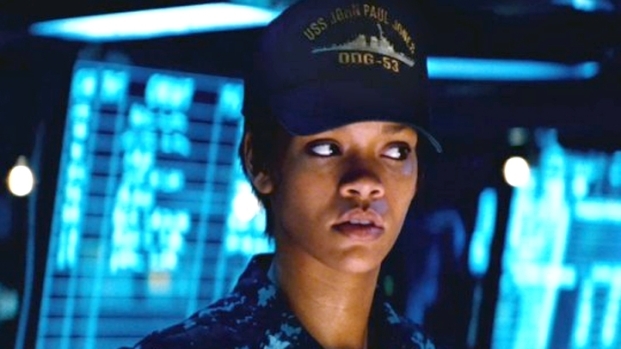 Rihanna Has Big Guns In "Battleship"
Pop star Rihanna tackles her first major movie role as a weapons specialist in the new Universal movie "Battleship". "I wanted to do something badass but I didn't imagine it would be grungy, like straight Navy soldier, no makeup," Rihanna said of her expectations for her first movie role. "I enjoyed it." Although the incident was clearly devastating for Rihanna, then 19, the two continued to stay in some kind of contact. At Brown's plea deal appearance, Rihanna requested the judge not issue an order demanding he stay at least 100 yards away from her. In 2012, both released new mixes of old songs, featuring each other, a move that caused a great deal of Internet chatter. More recently they appeared to be feuding on Twitter. Of the media attention that immediately surrounded the couple after the assault, Rihanna says that she "couldn't control that, so I had to deal with that, and that's not easy for me to understand or interpret and it's not easy to interpret on camera, not with the world watching. So it was hard for me to even pay attention to my mind and figuring things out because now it became a circus and I felt protective. I felt like the only person they hate right now is him." "Oprah's Next Chapter" will air Sunday, Aug. 19., at 9 p.m. ET on OWN.